What comes to your mind when I mention the word 'Africa?' If you're like most people, at some point you would have pictured crushing poverty, disease, starvation, war, and untold miseries (also the forests and animals, perhaps, but that's not the point here). This is how we as outsiders have been conditioned to think about Africa. While it's true that Africans have to deal with more than their fair share of problems, there is far more to them than this. Day to day lives are a mixture of highs and lows, just as in any other part of the world. Indeed, many Africans display an enviable joie de vivre, something that is very much on display in 'Aya de Yopougon.' Marguerite Abouet set out to create a work that shows the everyday life of Africans (well, Ivorians, to be precise) and not focus specifically on the more miserable aspects as many 'western' narratives are wont to do, something she achieves in this look at the lives of a few young women and those around them. 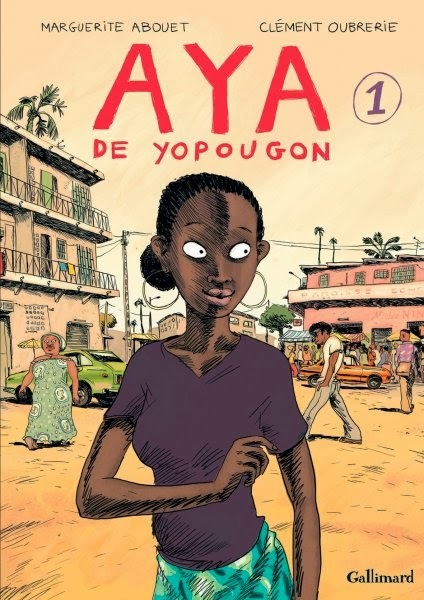 One would think the central character in this story would be Aya, the eponymous heroine, a resident of Yopougan (termed 'Yop City' by the locals), a popular area of Abidjan. And yes, she is reasonably central in some ways. But overall, the story seems to revolve more around the actions of her friends Adjoua and Bintou than Aya. If anything, the oh-so-well-behaved-and-ambitious Aya stands as a counterpoint to her more carefree and wild friends, who are keen on partying, marrying rich guys, and getting settled with a standard salon or clothing shop. Where this could have been a narrative about Aya and her dreams of becoming a doctor, overcoming the pressures of society and a deeply regressive attitude on the part of her parents (who do in fact think she should just marry a rich guy and not search for a meaningful job), but is instead a narrative about young women dealing with the highs and lows (some more challenging than others) of everyday life. But this is not a criticism of the story, per se. Indeed, this is a story that could have been a standard tale of a women from an impoverished background rising to achieve her goals despite obstacles in the form of family and society. Or a tale about her friends, one seemingly impregnated by the other's boyfriend. Or a series of other life-altering dramas. But no. At the end of the day, this is a tale that takes these events as parts of the everyday lives of these characters. They may become truly major (the pregnancy is a major event in this book, admittedly). But the focus is on different people enjoying life in their own ways. It's about young women and young men interacting in a country that was experiencing a period of relative success and joy under President Félix Houphouët-Boigny. It's a tale about people going to the popular clubs, to the local makeout spot, to the market, to friend's places; it's about the social interactions and the simple joys and problems of everyday life. This is a portrait of everyday life in a reasonably liveable African city in the 1980s, far removed from the myriad tales of war and poverty that define Africa. In this sense, Abouet succeeds marvellously. The art is interesting and has its own character. Is it beautiful art? That's a matter of perspective. But it captures the characters and the intended feel quite well, and that is what it was meant to do. And it captures the setting even better, giving the readers a sense of what life is like in Yop City for Aya and her friends. This is not a spectacular work. Indeed, it is not even a complete tale in many ways. The plot is largely irrelevant. But it set out to do something different, and does it well. It's not a book for everyone (the phrase 'your mileage may vary' is seldom going to be more relevant in the books reviewed on this blog), but it's a book worth a look-see at the least. Admittedly, only 3 of the 6 books in the series have been translated into English, but that should be enough. And for those like me who read French, definitely try it in the original language. The added slang and other aspects give the book a special Yopougon feel that may be lost to some extent in translated versions, and this is invaluable when looking at a slice of life in this region and for the section of society the book is about.